Written by chris maroulakos on Tuesday, April 24th, 2012 at 9:30am. If ever there were an exercise in excess and masochism, it’s Coachella. From Friday to Sunday, 75,000 music fans gathered in the Indio desert for the second weekend in a row to watch their favorite indie bands perform. But unlike the cold-weather fluke of the previous week, weekend two was a triple-digit scorcher that had the half-naked attendees scrambling for any sliver of shade they could find. As the mercury rose to a hostile 107 degrees on Saturday (a temperature the day would stubbornly cling to for the majority of the afternoon), tUnE-yArDs took to the Outdoor stage. Frontwoman Merrill Garbus attacked the set with all the manic, off-kilter energy that marked her June Soda Bar set. Garbus’ vocals were as unhinged as ever, looped into a frantic cacophony by her trusty pedals. tUnE-yArDs’ cosmopolitan sound is the closest thing this generation has to Graceland, and the expansive festival surroundings did well to complement the worldly vibe. Meanwhile, at the Gobi tent, punk forefathers Buzzcocks launched into their set. 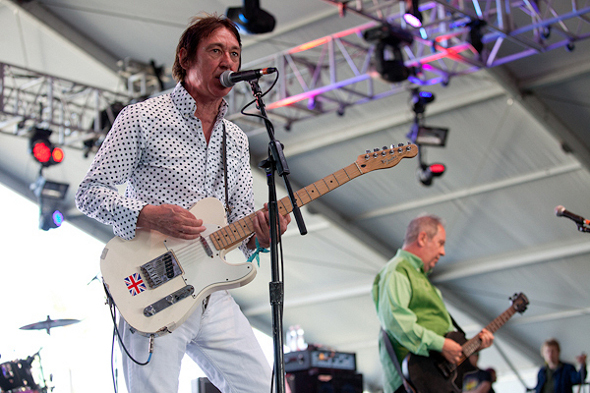 The British rockers might be decades past their heyday, but their talent hasn’t faded a bit. The four-piece looked more like respectable dads than irreverent punks, but the serrated edges of their guitars have stayed sharp over time. Peter Shelley soaked his vocals in a healthy amount of reverb, moaning melodically over Steve Diggle’s endless barrage of power chords. The pair tirelessly worked the crowd, striking poses and displaying a youthful exuberance that overshadowed their bald spots. Next, Andrew Bird began his set at the Outdoor stage. Strings, always the centerpiece of Bird’s storybook folk, fluttered and swirled around tracks from his new album, Break It Yourself. The sparse, staccato songs struggled for sonic dominance over the chatty crowd, but everyone grew respectfully silent when special guest Annie Clark of St. Vincent joined Bird to perform “Lusitania.” Clark’s star power gave a welcome jolt to a set that was a bit too intimate and sedated for the large festival setting. 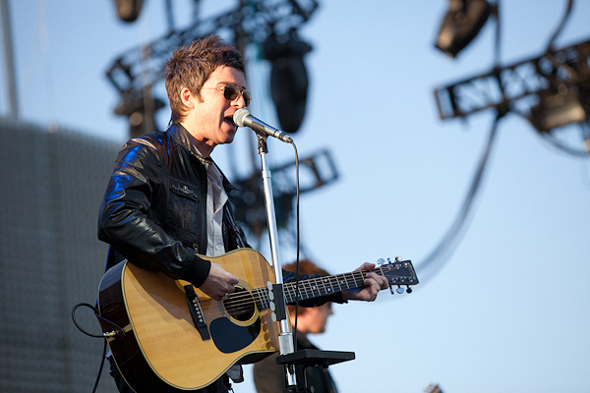 On the main stage, Noel Gallagher’s High Flying Birds did their best to avoid falling into a similar trap. The forceful opening song had an upbeat, country feel, which the band shook off in favor of a straightforward rock vibe for the remainder of the set. Gallagher’s nasally vocals can be distinctive, but were too often suffocated by the overly generic material. Still, the single “If I Had a Gun” was a predictable standout, thanks to its memorable melody and simple yet evocative lyrics. Unfortunately for Gallagher, people started leaving after just a few songs, heading toward the Outdoor stage where some guy named Jeff Mangum was about to begin his set. Read our review of Jeff Mangum’s performance here.